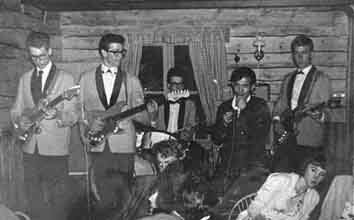 The band started in 1959 by the name of THE JET BLACK ROBBERS. They played on a big radio songcontest and ended as finalist, live on radio Luxemburg. This picture has taken in the snackbar which was owned by the father of drummer Wil van Gurp. On the left side of the picture is leadguitarplayer Bart Strik and next to Bart the rhythmguitarplayer Jos van Muyen. Robbie Boekholt gave Bart Strik the permission to use the name of his band THE HURRICANE ROLLERS. Robbie was impressed to hear Bart performing Robbie's composition ONCE. After Robbie Boekholt left the old Hurricane Rollers, the band quitted so Robbie passed on the name to Bart Strik. On the left side of the picture Jeff van de Akker, alias Big Jeff. He started as roadie, but after a little while he played the drums. Then Tim Schouten took over the drums, so Jeff started as the leadsinger. Bart and Tim left the Hurricane Rollers and started a new band with leadsinger Savage Kalman.. They called themselves: SAVAGE KALMAN AND THE EXPLOSION ROCKETS. On rhythmguitar Jan v.d. Boom. Bart Strik a as leadguitarplayer and en Tim Schouten on the drums. The band had several bassguitarplayers next to this formation. broad-cast from The Rock 'n' Roll-methode. Several L.P.'s were recorded in this period and the band even played live on T.V. on TROS TOP 50. In 1984 Bart Strik met his drumplayer from the early days, Wil van Gurp. Together with Wil van de Brink on bassguitar and ex-roadie Peter de Vaan as rhythmguitarplayer / singer. The band started all over again, however under the name THE EXPLOSION ROCKETS. But then destiny stroke and Bart became seriously ill so the doctor advised him to quit playing in the band. In 1986 the reunion started. Wil van Gurp met Jos van Muyen in Boekel (the first rhythmguitarplayer of Jet Black Robbers, see top-picture). Jos also lives in Boekel. One evening together was enough to restart THE EXPLOSION ROCKETS. After advertising for new members, they started the band with the folowing members: rhythmguitarplayer Thom Sens, leadguitarplayer Ad v.d. Burgt, singer John Poot, bassguitarplayer Jos v. Muyen and on the drums Wil van Gurp. The very last performance of Bart Strik before he passed away, with an occasional band in the Brabanthallen in Den Bosch in 1992. . .